Jeremy Hunt's apologies for the failures at Southern Health ring hollow, given that he believes markets and not ministers should be accountable for our healthcare. Image: George Julian. Rights reserved. “For me, it’s not a question of saying the NHS is ‘safe in my hands’. Of course it will be. My family is so often in the hands of the NHS. And I want them to be safe there. Tony Blair once explained his priority in three words: education, education, education. I can do it in three letters: NHS.” (Cameron, 2006). “It’s a tough gig bringing up a disabled child. Yep. It shouldn’t be, I know. Appropriate, timely and sufficient support would make a huge difference. And a seismic shift in public attitudes.” (Sara Ryan, Boundaries, February 11 2013). You are unrelenting in seeking support for your child, finding ways to navigate agencies and services making sure he can attend a caring school. You begin to write a blog - Mydaftlife- about your life, random happenings, images and observations; it soon becomes focused on life with your son as he ‘comes to the end of his school life and stands, unaware, on the edge of a huge gap in adult services’. As Connor becomes an adolescent, some of his behaviours become difficult to manage. You reflect on what his adult life holds in store, about the kinds of support he will need to continue to live a good life, a happy life, a decent and dignified live. Leading up to his 18th birthday, Connor gets increasingly anxious and agitated; he is laughing less, then not at all. Things aren’t working, Connor is depressed, unhappy, needs help, you all need help. He has some violent outbursts, and “the crunch” comes when he hits a teaching assistant at school. Connor is referred to a small specialist short-term acute assessment unit where his needs can be evaluated and a future care plan put in place. This NHS unit, Slade House, is only 5 minutes from your home and you will be able to visit him every day. It feels like a good temporary solution, one which will allow your family to work with medical professionals to figure out best options and a future plan for your son. “Our beautiful, hilarious, exceptional dude was found unconscious in the bath in the unit before a planned trip to the Oxford Bus Company. The psychiatrist from the unit who called me at work around 10am to say that LB had been taken to hospital, gave no steer he was pretty much dead. I asked her (as an anxiety induced after thought) if he was conscious when he left the unit in the ambulance. She said they’d cleared his airway but he hadn’t regained consciousness. She made no suggestion I should urgently go to the hospital or that I should go with someone. It was a care less call. Much like the ‘care’ he’d always experienced outside home and school. I arrived at the hospital twenty or so minutes later, with a work colleague who (so, so kindly) insisted on coming with me. I was immediately faced with a LB has a ‘dead heart only kept alive by a ventilator’ story. This news generated my, to that point, unknown sounds. I hugged him while he died. We are now in a space I can’t describe (Sara Ryan, The Day After, July 5 2013). Connor Sparrowhawk (known as Laughing Boy, or LB) drowned in the bath in an NHS Assessment and Treatment Unit (Slade House) for adults with disabilities, on the 4th of July, 2013. Connor was 18 years old and had been in ‘the care’ of the unit for 107 days. The NHS Foundation Trust (Southern Health) initially attributed his death to natural causes. A two year fight to be told that an epileptic teenager with learning disabilities shouldn’t have been left unsupervised in a bath in ‘a secure and safe’ specialist unit. As a consequence of Connor’s death, and under considerable pressure from the #JusticeforLB campaign, NHS England commissioned Mazars, an auditing firm, to review ‘all deaths of people in receipt of care from Mental Health and Learning Disability services in Southern Health Trust between April 2011 and March 2015’. The findings of this report reveal that this particular trust had failed to investigate the deaths of more than 1,000 patients with learning disabilities or mental health problems. “The deaths of people with a Learning Disability are not made visible in the recorded data presented to the Trust Board and to regulators and commissioners whether expected or not; natural or unnatural... It is not therefore possible to rely on published information as an accurate measure of risk or death related incidents in the Trust...The overall level of unexpected deaths has not been reported anywhere so there has not been an accurate reflection of the levels of deaths occurring amongst patients.” (Mazars,Independent review of deaths of people with a Learning Disability or Mental Health problem in contact with Southern Health NHS Foundation Trust, April 2011 to March 2015, December 2015). The Mazars report couldn’t, in the absence of accurate data, account for the number of learning disabled people who had died in their care: It did reveal that nobody was accounting for them. “the Mazars review brings into the open what feels like a fundamental disregard for the lives of people with learning disabilities, even within organisations that are supposed to be supporting people.” (Chris Hatton, Heart of Darkness, 2015). The #JusticeforLB movement has succeeded in exposing the most disturbing and penurious facts about the British states treatment of learning disabled people since the Winterbourne Inquiry (which detailed the criminal abuse by staff of patients at a privately owned care facility called Winterbourne View Hospital, near Bristol, but was only exposed by the work of undercover journalism supported by the BBC’s Panorama team). Since Connor’s death, many have come forward to speak about ongoing failures in care for learning disabled people, about neglect, about their struggles to get answers about the deaths of loved ones, and about their fears for the future in the face of seemingly permanent reductions in funding for adult social care. In the context of permanent austerity, Connor’s death raises fundamental questions about the future of welfare itself. Indeed, it is imperative that we understand #JusticeforLB’s struggle for accountability within the context of what Youssef El-Gingihy calls the the “virtually impenetrable” Health & Social Care Act 2012, which came into law three months before Connor’s death. One of the first casualties of the Health and Social Care Act was accountability itself - as Jacky Davies, John Lister and David Wrigley note in their important account of the systematic demolition of the NHS, NHS for Sale: Myths, Lies and Deception. Questions about the impact of NHS reforms on accountability were raised by many before the Act came into law; see for example Accountability in the NHS: Implications of the government’s health reform programme and Lords warn on ministerial accountability in NHS reforms. While we know why Connor died (he died of neglect), to have his death accounted for has proven more challenging. This is due in no small part to the baffling complexity of what we used to call ‘the National Health Service’ (NHS). In effect, the NHS no longer exists, or at least not in a form those who created it would recognize. The Kings Fund has produced an animated film which attempts to explain the structure of commissioners, boards, trusts and service providers who constitute the contemporary NHS since the most recent round of ‘reforms’ instituted by the coalition Government in 2012. Today, the closest thing we have to central governance, and national level accountability, within the NHS is “a body” called NHS England, which receives the bulk of tax-payers funding to pay for the services we receive. NHS England is primarily a commissioning body, however, the bulk of actual commissioning work is devolved to local ‘Clinical Commissioning Groups’ (made up of a select few doctors and nurses, ‘health managers’ and a significant number of private health company representatives and shareholders) who commission services from a range of public and private ‘service providers’. These changes in the government of the National Health Service were made, the public was told, in order to “liberate” hospitals, GPs and local authorities. As of 2012, this tangle of ‘NHS bodies’ would decide what kinds and levels of provision to make to the public. Much of the groundwork had been laid by pro-market ministers under Tony Blair’s government, who started encouraging NHS hospitals to become business-like ‘Foundation Trusts’ – but Cameron’s 2012 Act seriously ramped up the shift from central, state accountability, to ‘market’ accountability, leaving local NHS managers no other choices. In the case of Connor Sparrowhawk, the ‘liberated services’ which had been ‘commissioned’ to care for him were provided by an NHS Foundation Trust called Southern Health, who are one of England’s largest providers of ‘community health, specialist mental health and learning disability services’. Mazars concluded that those in charge of overseeing the delivery of Southern Health services had catastrophically failed. In particular they noted that a ‘failure to bring about sustained improvement in the identification of unexpected death and in the quality and timeliness of reports into those deaths is “a failure of leadership and of governance”. What are the consequences of this failure? Who can be held to account in a context where the government has devolved its “constitutional responsibility” to provide NHS services? Where does legal and political responsibility lie? With those whose neglect contributed to Connor’s death? With Southern Health? With the CCG who commissioned their services? With NHS England? With the Secretary of State for Health? If all of these ‘bodies’ are in some part accountable, who can hold them to account, what are the systems for accounting? On December 10th 2015, the leaked Mazars findings provoked the tabling of an ‘urgent question’ to the Health Sectary Jeremy Hunt in the House of Commons. Hunt made a public apology to Sara Ryan and her family. Hunt thanked the #JusticeforLB campaign, and suggested he was grateful for their exposure of the failures at Southern Health. Attlee was the Labour Prime-Minister (1945 to 1951) who oversaw the development of the post-war welfare state. His Health Minister, Aneurin Bevan, created the National Health Service (NHS) in 1948. Hunt’s political ambition, to rid the government, and specially the Department of Health, for accountability for failures in care, is precisely what has come to pass, though the establishment of NHS England, and chaotic and ill-prepared local Clinical Commissioning Groups. Decentralised ‘accountability’, said Hunt's book, ‘must be direct, democratic and local’. In actuality Hunt’s ‘devolved’ accountability equates to market-based accountability, which exercises authority through obfuscation - strategies which seems to centre on tiring out those who attempt to question and challenge. To put it more plainly, permanent reductions in public services necessitates the erosion of structures of accountability. 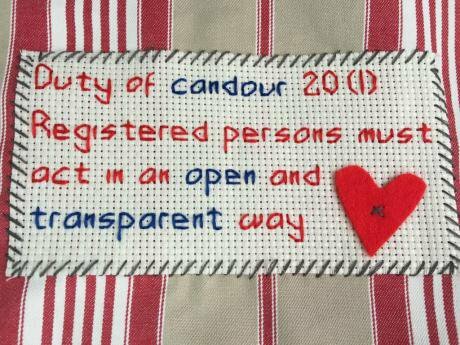 The #JusticeforLB campaign has exposed the extent to which NHS ‘reforms’ have undermined systems of public accountability for publically funded services. This has been no small undertaking, but has involved the harnessing of an arsenal of digital and off-line activist strategies: twitter, blogging, vimeo, the #LBBill, the Justice Quilt, the Justice Shed, films, art exhibitions, picnics and flags. This is a movement grounded in grief and love, but moved, agitated, kept alive, by the promise of justice for people with learning disabilities, and the possibility of a different welfare future.